Gunnison-Crested Butte’s charming main streets may surprise you on your first visit. You won’t find much in the way of chain stores. Instead you’ll find locally-owned shops to cater to most of your needs. So wander on down Elk Ave or Main Street and check out the offerings. With so many beautiful vistas to inspire, it’s no wonder that our local artists in Gunnison County are highly productive. Our local art galleries are stocked to the brim with stunning works of art for you to take home as remembrances from your trip or to give as gifts to those who were unable to come with you. Need a replacement bulb for your headlight or a reflective shield for your windshield? Visit one of our local auto shops to get whatever you desire. Hardware stores are not just for tool shopping. Pick up some wildflower seeds to take home, or some holiday decorations for your condo or vacation home rental to make things a little more festive. With hardware stores in both the north and south ends of Gunnison County, no matter your needs, our partners are here to help. 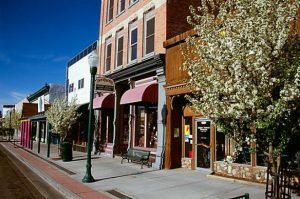 Whether you’re looking for a little piece of local history or a national bestseller, Gunnison-Crested Butte book shops have a broad selection of great books and games. Check out our local bookstores to find great literature in Gunnison County. In the mountains the motto is “dress in layers.” If you didn’t bring enough layers with you, or you want to pick up some mountain style to take home, check out our clothing stores. With Crested Butte being the Wildflower Capital of Colorado, it’s no wonder that we have outstanding florist shops in Gunnison County. No matter your sport of choice, one of our local rental shops can set you up with all the gear you need for a successful day in the mountains. If you happen to be here at the tail end of a season, you may even be able to get some great discounts on lightly used rentals! Our main streets provide one-of-a-kind, locally owned shopping experiences with a variety of gift shops offering one of a kind gifts and souvenirs! Whether you are staying up at Mt. Crested Butte, Crested Butte or down in Gunnison, we have full service grocery stores that are there for your shopping needs. Needing a pharmacy? There are two major chains down in Gunnison that are there for your prescription needs. Our two health food stores are great for visitors with dietary restrictions (and a great place to pick up a tasty lunch, too). Don’t expect to find a wide beer, wine, or liquor store in a grocery store though. You’ll have to head to a liquor store for that. Our local home and kitchen stores have everything from furniture and homegoods to kitchen and glassware. Many specialize in Southwestern Styles, but other styles are available, too. Colorado and craft beer go hand in hand; it’s in the top 5 states for both breweries per capita and total breweries. In recent years, there has been a renaissance of craft distilling in Colorado as well. Visit one of our local liquor stores for a taste of Colorado.. In recent years, there has been a renaissance of craft distilling in Colorado as well. Visit one of our local liquor store partners for a taste of Colorado. With communities as devoted to the arts as those of Gunnison County, it’s no wonder that we have musically-minded shopkeepers as well. Check out our partners to find the perfect music-related item to take with you! In Gunnison-Crested Butte, even the office supply shops have a touch of funk and flair! Check out one of our partners for any last-minute office and stationary supplies you need while you’re visiting. You won’t be disappointed! Inspired by nature, our local photographers capture stunning scenery on a daily basis. If you’re looking for a timeless piece to immortalize your most recent visit to Gunnison-Crested Butte, we encourage you to check out our local photographers. Don’t worry if you left some pet supplies at home by accident. Our local pet stores are well-stocked with necessary items that you may need on your next vacation to Gunnison-Crested Butte. They also have some fun stuff, too!